We made the reservation weeks ago. 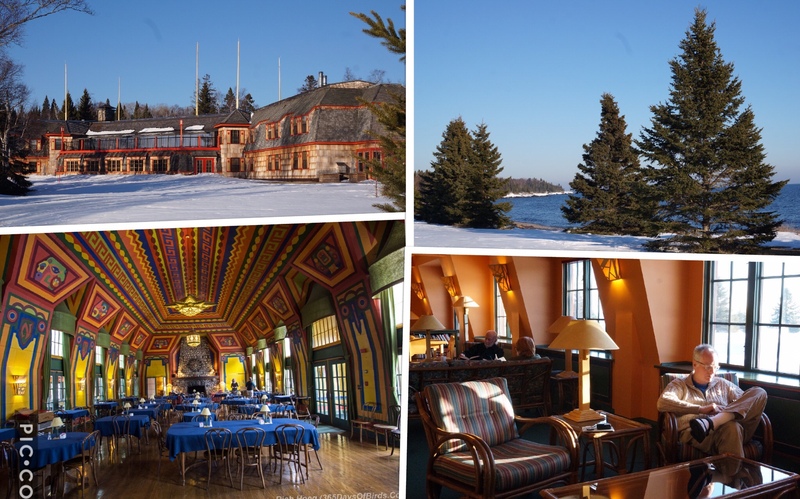 A mid-winter weekend at Naniboujou Lodge is a treat in itself, but Mother Nature threw us a curve ball that made it picture perfect. As cross-country ski enthusiasts and lovers of winter, we cringed when we saw the forecast for continuous days in the 40s. But as visitors to the North Shore, we reveled in constant blue skies and sunshine with real warmth. We put skiing at the top of our agenda, knowing the snow conditions were likely to suffer through the weekend. 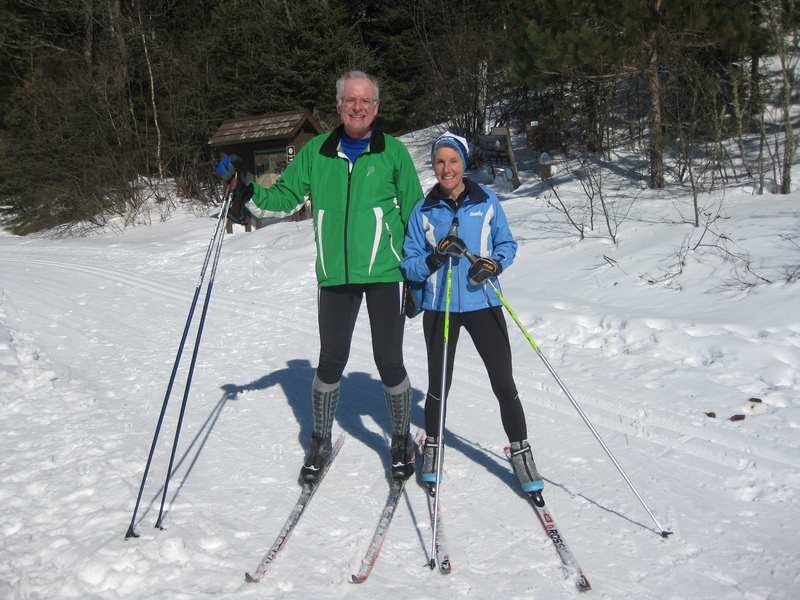 A morning ski at Oberg Mountain gave us beautiful soft snow before it got too soft and sticky. 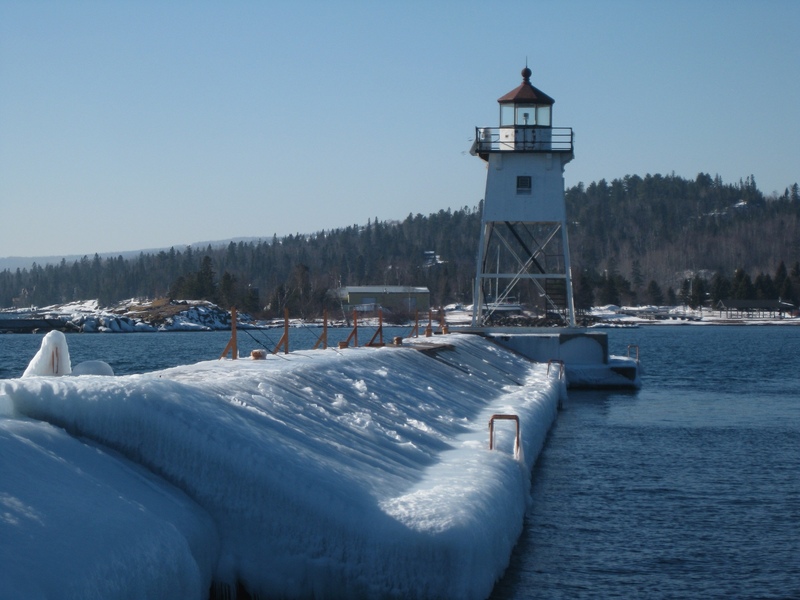 The harbor in Grand Marais sparkled in the sunshine, and the sun melted enough of the ice and snow for me to make it most of the way out to the lighthouse. It was so warm at the Java Moose that customers took their coffee drinks outside to bask in the Adirondack chairs. Could this really be mid-February? Naniboujou Lodge was a lovely oasis. The rock beach was exposed and waves crashed onto the shore. Its deliberate lack of wifi and cell service was a fine excuse to read and relax in the quiet sunroom. And because they offer only package deals in the winter, we feasted morning and evening on fine meals in the colorful dining room. What’s not to like about that? 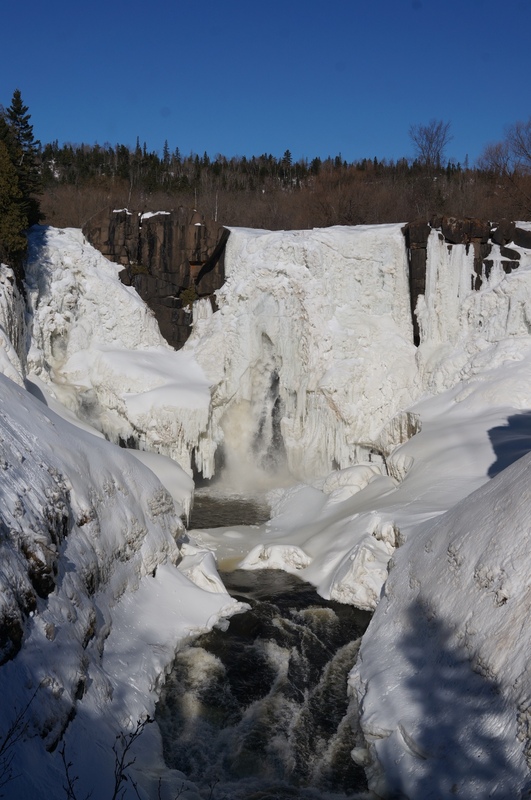 A trip to the Pigeon River, right on the Canadian Border, necessitated a walk up to High Falls. The warm weather had released sections of ice over the waterfall, giving us a view of the rushing water. It was easy to stop and look around amid the din of the falls in the mild temperatures. The Witch Tree was nearby, and Rich knew how to find it. So we made a trek through soft, wet snow to its sacred location. There were signs informing us of its significance to the Ojibwe people, and asking us to remain silent and refrain from smoking. But there was a good platform from which to view the tree from a respectful distance. I’d seen many photos of the tree before, but never actually laid eyes on it in person. The afternoon sunshine lured me outside once more. Judge Magney State Park was just across the road, and I followed the hiking trail up the Brule River. It was pretty easy going for the most part, with well packed snow. But inclines were slick and the 175 steps down to the middle falls required careful balancing on the narrow exposed wood on the edge of each step. The water shot forcefully out from under the ice at the falls and disappeared again, leaving a fine mist in the air. Devil’s Kettle proved to still be ice covered. If only I’d known, I would have spared myself the hairy climb and slipping down the treacherous slope that led to it. But it was so nice out, I was happy to prolong the hike. 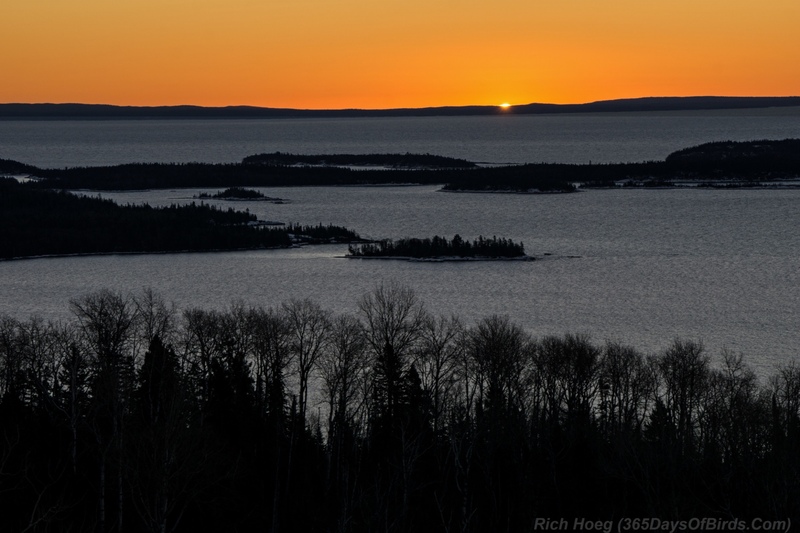 Rich preferred seeking photo spots for the beautiful sunrises over the lake and starlit nights. He obviously does it well. This weekend was a gift from our son Carl and his bride Chelsea. We loved their selection of Naniboujou Lodge, and the unending blue skies that accompanied our visit made it even more memorable. Thank you! 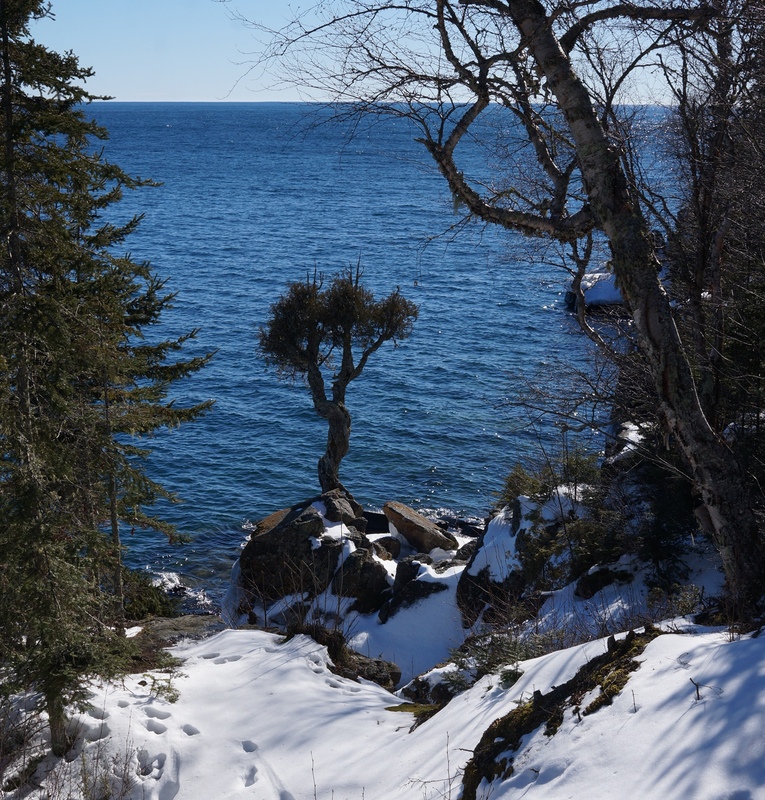 This entry was posted in Life Up North, Outdoors and tagged Lake Superior, North Shore, Outdoors by Molly. Bookmark the permalink. Happy to know you had a lovely weekend! Only news I had heard was that you turned back because of muddy trails so it was reassuring and refreshing to read this blog – sorry we missed you. My class went over well but the exceptionally warm weather kept two away. Blessings! You actually walked most of the way out to the Lighthouse. Molly, you’ve got to be nuts. Even if the snow had melted, what about the ice. 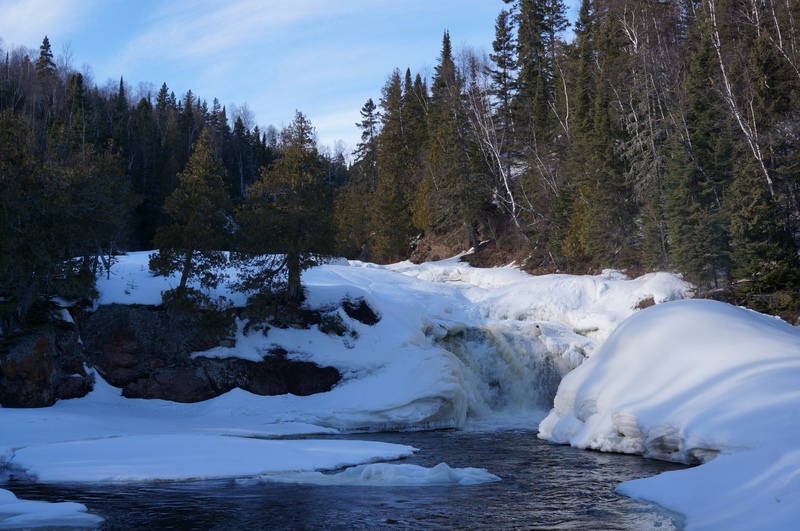 Bill and I walked to Temperance River three days ago and my heart was in my throat with patches of black ice covering much of the trail. And, then to creep down all those stairs to Devil’s Kettle. Did you have yak tracks on? So glad you are safe. It was actually totally clear up to the point I stopped short of the lighthouse – I’m not that crazy! It sure was a beautiful weekend.